There are many types of Veterinary Specialists now available to treat pets, such as Oncologists, Dermatologists and Orthopaedic Surgeons. Ophthalmology is our field of specialisation. Just as your local family doctor may refer you to a specialist to help solve difficult problems, your local vet has referred your pet to a Veterinary Specialist. 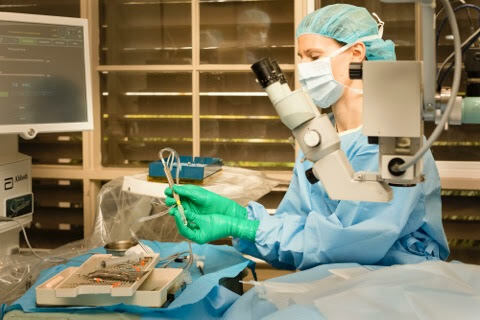 Veterinary Specialists have a very high degree of training in their chosen field. Specialists also have highly specialised equipment that your local vet usually wouldn't have such as Tonometers, very high-powered operating microscopes, slit-lamp microscopes, Electroretinogram units and Phacoemulsifiers for cataract surgery. To be able to call themselves a Specialist, a vet needs to have graduated from the usual five-year Veterinary Science degree, worked for four years as a vet in general practice and then completed a three to five-year training program in their chosen field. Only after passing numerous written and oral exams does the vet achieve Fellowship with the Australian and New Zealand College of Veterinary Scientists. Here at All Animal Eye Services, we do not offer services and products that your local vet does, such as de-sexing, pet food or flea treatments, as our sole purpose is to help your pet see clearly.